Visiting the Royal Tapestry Factory is one of the attractions Madrid offers in order for you to understand Spain’s proto-industry in the Eighteenth century, linked at first to the Court and with evident French influence, since it was created by the first Bourbon monarch, King Philip V.
During the early modern period and until the early Nineteenth century, international trade was dominated by mercantilist policies which enabled states to be self-sufficient in the manufacturing production in order to trade with other countries. The Royal Tapestry Factory embodies that conception of the economy. The Santa Bárbara Royal Tapestry Factory was founded in 1721, occupying a building next to Puerta de Santa Bárbara, which then was one of the entrance gates to Madrid. It specialised in the production of tapestries as a luxurious item, in principle, with Flemish-style designs and it enjoyed its golden age during the reign of King Charles III. In fact, Goya painted many drawings and pictures so that they could be transformed into tapestries. 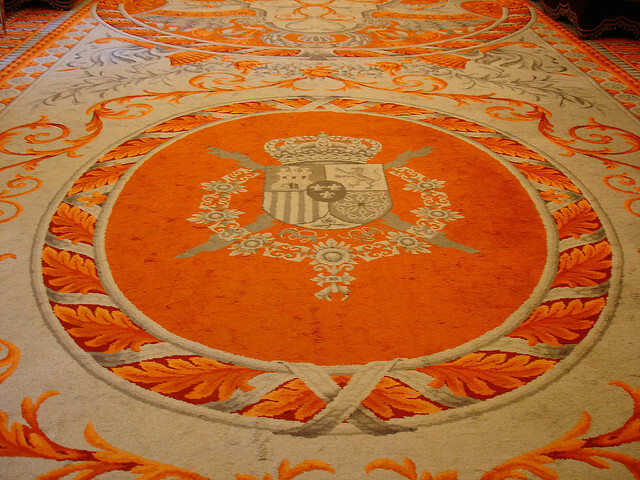 The Spanish Royal Family has used these tapestries in their palaces and, today, the Royal Tapestry Factory is still elaborating tapestries, carpets and coats of arms by hand. It also carries out an important job restoring and maintaining fabrics with huge historical and cultural value. It is also important to mention that you can visit a permanent exhibition in the current building, considered a Neo-Mudéjar Asset of Cultural Interest whose construction was finished in 1891. The Royal Tapestry Factory is located in the centre of Madrid, between the metro stations of Atocha and Menéndez Pelayo and connected by bus lines 10, 14, 26 and 32C. You can visit it from Monday to Friday from 10.00 a.m. to 2.00 p.m. and general admission costs 5 euros.